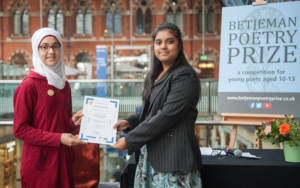 Founded in 2006, on the centenary of former poet laureate Sir John Betjeman’s birth, the Betjeman Poetry Prize is a charity in the education sector working with partners across the British Isles to promote literacy, foster creativity and provide a platform for new voices from the next generation. 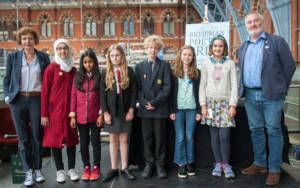 The Rothschild Foundation proudly supports the writing competition which invites entries from 10 -13 year olds across the British Isles, who must write on the theme of ‘place’. 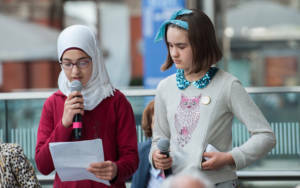 Connection to place is central to John Betjeman’s work and the Prize’s theme aims to encourage young people to look closely at their environment and to question where they come from and who they are. Amineh Abou Gerecht was announced as the winner with her poem ‘Lament for Syria’ which can be read below. their call cries in my eyes. where soldiers don’t walk over my face. and make allowances if I burst into tears. free of mess, war, wreckage and misery. in the cries of the doves. I hear your screaming cry. My wing is broken like your wing. From a place where a mother teaches her son not to step on an ant at the end of the day. From a place where a teenager hides his cigarette from his old brother out of respect. From a place where old ladies would water jasmine trees at dawn. From a place which endured, which waited, which is still waiting for relief. I will not write poetry for anyone else. how to make a homeland?